Join us for the world premiere of Schisma featuring collaborators Joseph Heitman and Katie Lake. Melding contemporary dance forms with the classical structures of the ballet line, dancers will dive into the intention of movement as a partnership with time, and the ability to work against it. The class will begin with a process-based guided warm-up, followed by learning stylized repertory phrase work unifying the sensibilities of musicality, rhythm, and pulse. Intended for advanced/professional and pre-professional dancers. Marie L. Paspe (Bill T. Jones/Arnie Zane Company) and AD Peter Cheng collaborate on a new work to be presented at NACHMOx The Tank. One evening limited engagement. Presented by White Wave Dance Company. Cheng will be showing an excerpt from DRAFT NO. 31/redux. Join Hi Artist for an evening of drinks and dance performance, featuring works by Peter Cheng, Amanda Krische, kamrDANCE (Alexis Robbins and Alice Halter). AD Peter Cheng joins Lydia Johnson Dance for the company's 2018 Home Season at Ailey Citigroup Theater. AD Peter Cheng joins konverjdans for their 2018 Spring Performance at the James & Martha Duffy Performance Space. AD Peter Cheng performs with konverjdans at Norte Maar's CounterPointe 6 - New Work by Women Choreographers. AD Peter Cheng performs DRAFT NO. 31 at Y CABARET presented by Bearded Ladies Productions. 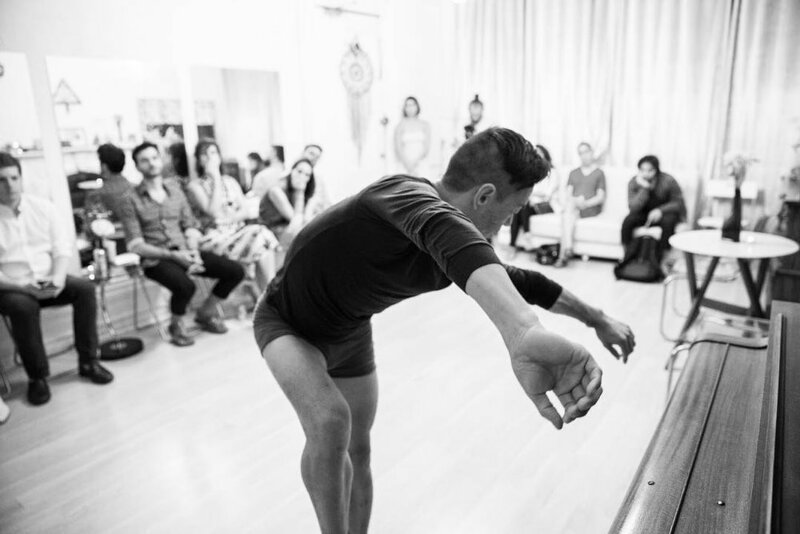 AD Peter Cheng performs with Lydia Johnson Dance at Entrances & Exits: Spring Studio Showing. DRAFT NO. 31 at STUFFEDArts' quarterly STUFFED: Dinner and Dance. 92Y Harkness Dance Center presents Fridays at Noon - Young & Nervy: Dances from the Edge. Peter & Co. will present an excerpt from Draft No. 31. As a part of NimbusPRESENTS APAP 2018 Showcase, Peter & Co. will present an excerpt from Draft No. 31. Performance Studio Open House (PSOH) is a work-in-progress showing through the Center for Performance Research (CPR). Peter Cheng joins LJD in the studio. Peter & Co. has been invited to present a shared evening of repertoire at the Seattle International Dance Festival's Inter|National Series, including community engagement events the week of June 26th, 2017.